Short Video Clip of the maiden voyage. Then come the surprising bits! This boat is amazingly light! Despite its ample size, the 15' hull weighs only 60 Kgs (light weight), compared with say a Sonnet (14'3) at 70 kgs. The Argie 15 is a much more substantial hull than the Sonnet and also more robust - thanks to its frameless stitch-and-glue construction. The other surprising part is how fast it is! Well I suppose it shouldn't be that surprising as it has a powerful rig, good waterline length, a flattish planing stern and low mass..... another example of Dudley's ability to put modern thinking in a traditional package. Admittedly it can never be a high-performance skiff like the Paper Jet - for that it would need suitable sides for hiking out, trapeze, and an open transom. But in moderate conditions it will surprise many other contemporary dinghies, and in skilled hands it can reach amazing speeds. Spacious hull and sailing cockpit. Versatility is excellent. 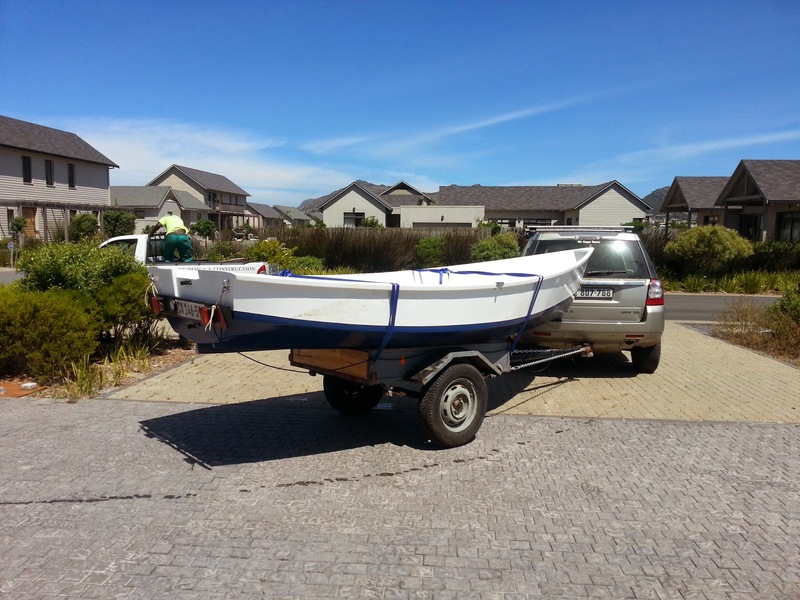 Its a great sailboat, a comfortable boat to row or motor, and a great picnic boat with its ample and high seating. It moves very easily under a 4Hp auxiliary no matter how laden. The example shown above has the side seat option - which were added later to the design to make for comfortable sailing. Without the side-seats, the floor below can be covered with a slatted cockpit sole which offers plenty of space for sleeping and camp-cruising. Plenty of stowage in the bow too. Lovely sharp bow, a bit like a fishing "Panga"! Seakindly and smooth. Hull works well whilst level or inclined. The high, flared bow with overlapping gunwales makes it a nice dry boat in a chop. 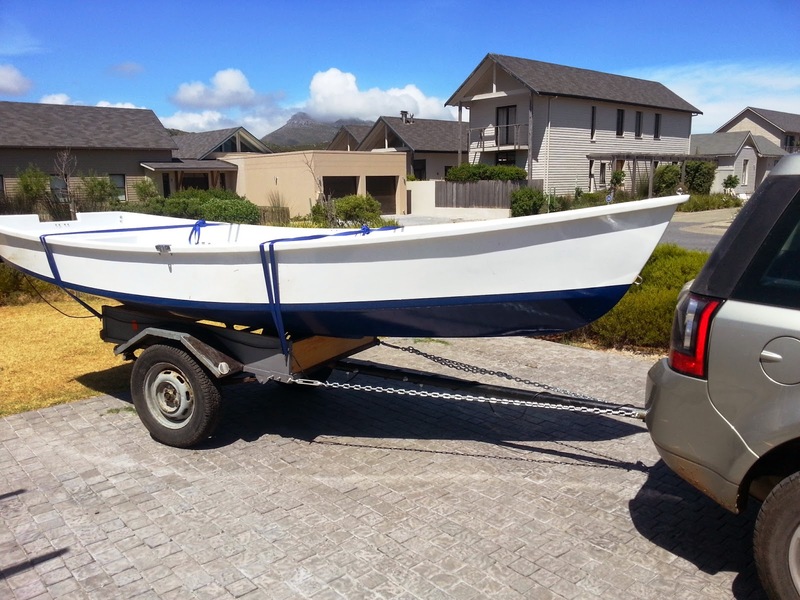 The Argie boats were originally commissioned by our local newspaper - the Cape Argus. The first one was built by David Biggs - a very well known reporter and columnist on the staff. A man with a well known propensity for good wine, the outdoors, classic motorbikes (and scooters) and good humour! Somehow the brands seem very compatible! This was not unlike the case of the Mirror dinghy, conceived by the Daily Mirror in the UK in the early 1960s. 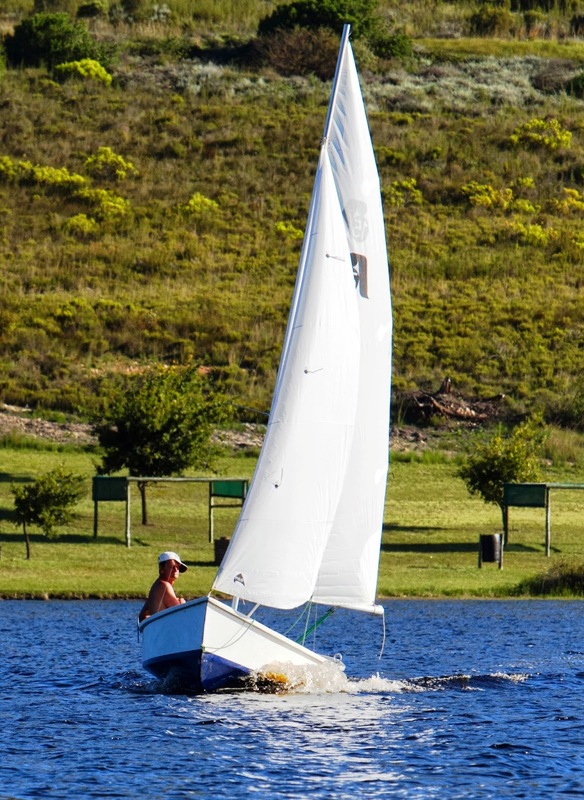 Although the orginal Mirror Dinghy is significantly smaller than the Argie 15, the boats share a number of similarities - both are uncomplicated traditional boats intended for home-building in plywood. Both offer the option to store the entire mast within the hull whilst trailering. Both are very easily built using stitch and glue construction - in fact the Mirror was the pioneering design of this method for sailing dinghies as I recall. The Argie 15 is a much more capable boat in every way and far better looking, although the Mirror dinghy class is by now one of the largest in the world now and has a very active racing fleet. Both have been extraordinarily successful concepts. I suspect the Argie would be easier to build in fact despite its larger size, and Roy (of CKD Boats) tells me it is in fact quite a bit cheaper too. 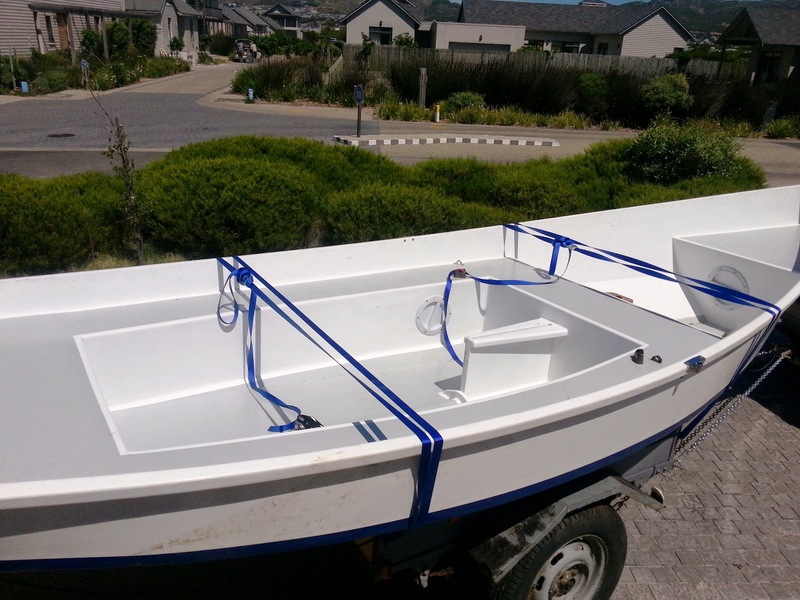 CKD Boats do a very good and affordable kit in Cape Town, although many other suppliers are listed on www.dixdesign.com. Dudley has full details of the design on his website here. aids tracking, and makes it easy to beach the hull. 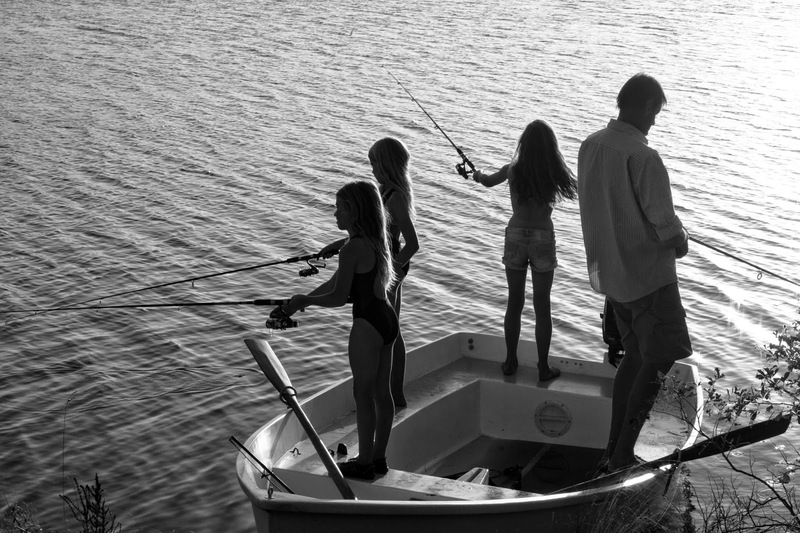 but in addition will allow the boat to sit level on a beach without rocking. Transom is fairly high, with space and provision for a small outboard next to the rudder. Hull is amazingly light and easy to lift on/off a small trailer. For myself - this will be my next dinghy when time allows. I have already acquired the rig and a small outboard! 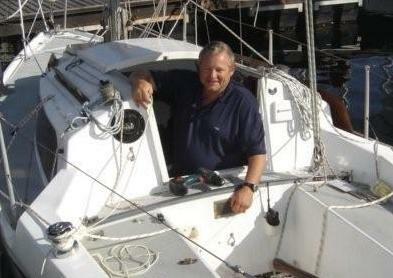 STOP PRESS: Dudley has just now (8 June 2014) added a great article on the Argie 15 on his blog. This contains a fair bit of the history of this boat.